1. I understand that MMS cannot be held responsible in any way whatsoever, and dealings are at my own responsibility. 2. MMS have the right to amend any entries as appropriate. 3. If you do not wish to advertise then you will state this on the registration form. 4. I understand that my email address will be given to interested Muslims unless I state otherwise. 5. Membership can be refused or terminated at any time by MMS in which case a refund will be provided. Otherwise all fees once paid are not refundable unless for telephone numbers not provided. December/January and July/August will be double month issues. Magazines will be posted in the first week of each month. Entries received at least one week before the end of each month will be included in the magazines. 6. These conditions are subject to change at any time and any changes can be viewed on the website. 7. I promise and confirm that I understand that the services provided by MMS are highly confidential and shall not be leaked or passed on to anyone except to my parents/guardian/son/daughter concerned, as appropriate. 8. 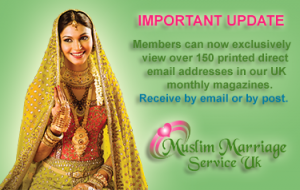 Telephone number request – this service costs £10 for UK members for which you will be provided with telephone numbers for up to any 12 Muslims in the current edition only. If the member concerned has not given their consent then you will need to reply by letter (including a stamped envelope) to: Muslim Marriage Service, P.O Box 15, Manchester, M25 OPB. If no telephone numbers are available then your payment will be returned. We are unable to provide telephone numbers over the phone although they can be faxed or emailed if you have prepaid. 9. Non UK members – for payment of £25 you can receive upto 12 email addresses and telephone numbers (where available) of UK and non UK resident Muslims. Receipt of your payment and contact details will be forwarded by email upon receipt. 10. We cannot be responsible for the accuracy of information provided by members. Any telephone numbers / email addresses provided cannot be guaranteed to be correct. 11. I promise that all correspondence I make will be according to Sharia and for the purpose of marriage only. All correspondence will be without abusive or aggresive language. I will notify you after marriage so my details can be withdrawn. I agree to pay Muslim Marriage Service the sum of £100, after marriage with a member. This amount will be considered payable under Sharia and Muslims will NOT be legally foced to pay. 12. I am a Muslim by faith. To the best of my knowledge all the details and information I provide will be accurate.